Education plays a vital role in building the future of our nation by transforming lives and communities. We have several educator heroes who help students aim high and achieve their potential, often meeting and overcoming considerable challenges along the way. Recently Delhi based MT Research & Educational Services (MTRES) came up with Teaching Excellence Awards (TEA) 2018, to recognize the monumental role teachers play in our society as they instil a desire to learn and achieve and create tomorrow’s leaders. 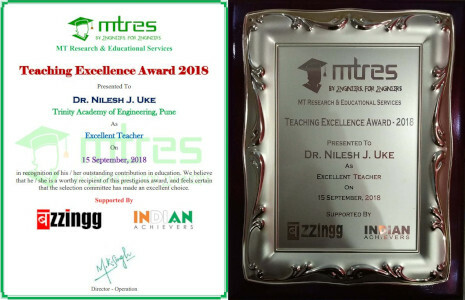 Meet one of the awardees, Dr. Nilesh Uke, Principal, Trinity Academy of Engineering (TAE), Pune, Maharashtra, who has been honoured with Excellent Teacher Award in MTRES TEA 2018. People in the entire world are converging; and is true with education. Today’s multidisciplinary nature of education needs to fill the gap; and is done rightly by MTRES. Various events conducted by them are remarkable and will help all stakeholders to keep pace with industry. Dr. Nilesh has more than two decades of teaching experience. He received B.E. 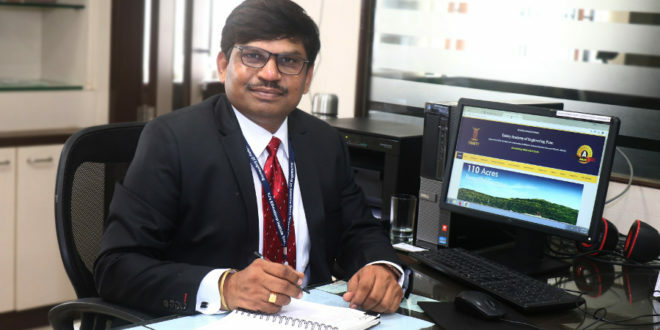 degree in Computer Science and Engineering from Amaravati University, Maharashtra, in 1995; M.E. from Bharathi Vidyapeeth, Pune, Maharashtra, in 2005; and Ph.D. degree in Computer Science from SRTM University, Nanded, Maharashtra, in 2014. He started his teaching career from Department of Computer Science, National Defence Academy, Khadakwasla, Pune. Later he joined Department of Information Technology, Sinhgad College of Engineering, Pune, which is affiliated to Pune University. He also had the opportunity to work with Pimpri Chinchwad College of Engineering for couple of years before he took over as Principal and Professor in Trinity Academy of Engineering (TAE). I feel proud that I worked at The NDA as it gave me the opportunity to nurture the cadets who would be future officers of Indian Armed Forces. His current research interests includes Visual Computing, Artificial Intelligence, Human Computer Interface and Multimedia. He has guided the research of 4 Ph.D. and over 25 PG scholars. He is member of IEEE, ACM and Life Member of the Indian Society for Technical Education (ISTE) and Computer Society of India (CSI). He has also co-authored two books – Human Computer Interaction published by Nirali Prakashan in 2011 and Management Information System published by Nirali Prakashan in 2010. Dr Nilesh has delivered 100+ guest lectures on various domains of Computer and information technology at different engineering colleges in Pune University. He has arranged / coordinated more than 16 Seminars / Workshops / Conferences in last 15 years. He has delivered expert lectures at various Faculty Development Programmes (FDP), STTP or Conferences. He is Editor / Reviewer for various International Journals and International Conferences. Dr Nilesh Uke was honoured with IOSRD Young Scientist Award 2018. International Organization of Scientific Research and Development instituted the scheme of Research Award with the aim of distinguishing Researchers of extraordinary Promise and Creativity who have made notable research contributions in Science and Technology. Dr Nilesh Uke was honoured with Cyber Crime Helpline Award 2017 organized by Digital Task Force & Cyber Crime Helpline at Pune. This award is presented to those who had actively contributed in the Financial Fraud, Cyber Crime Investigation, Insurance, Risk Assessment, Computer Forensic, Legal, Compliance, Audit, Information Security, Technology and Law Enforcement. Dr Nilesh Uke was honoured with Best HoD Award at Dell Campassador Program organized by Dell India at Banglore in 2016. Dell India had felicitated its top Campassadors from around the country in the final leg of its college engagement program aimed at spreading technology and PC knowledge among the college going youth. 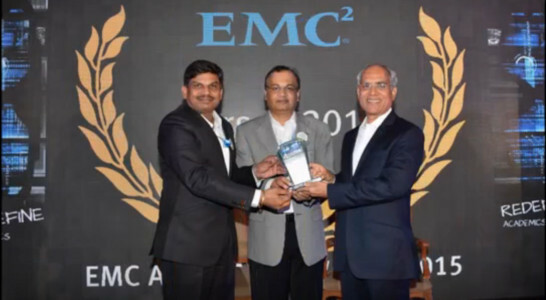 Dr Nilesh Uke was honoured with EMC Star of 2014 Award at EMC Academic India Awards, Chennai, 2015 for significant contribution in academia and industry. My students, who help me learn new things while I teach them, keep me motivated. Each and every student of my class is a motivating figure for me. Aside from his administrative duties at TAE, he is a member of Ph.D. thesis evaluation committee of RTM Nagpur University, S.G.B. Amravati University and Anna University Chennai, Tirunelveli, Tamilnadu. He is also a member of the Ph.D. Interview Committee for Computer Engineering for SPPU and MIT-WPU. He has also served as Assistant Director of CAP (Revaluations) for F.E. to B.E. University theory examination. He would like to continue to spread knowledge to all those who approach him to get any problem solved. He sees himself to be a fantastic teacher throughout the journey of his life.